Habitat for Humanity of North Carolina (Habitat NC) is a 501(c)(3) and one of 31 state support organizations (SSOs) across the country. 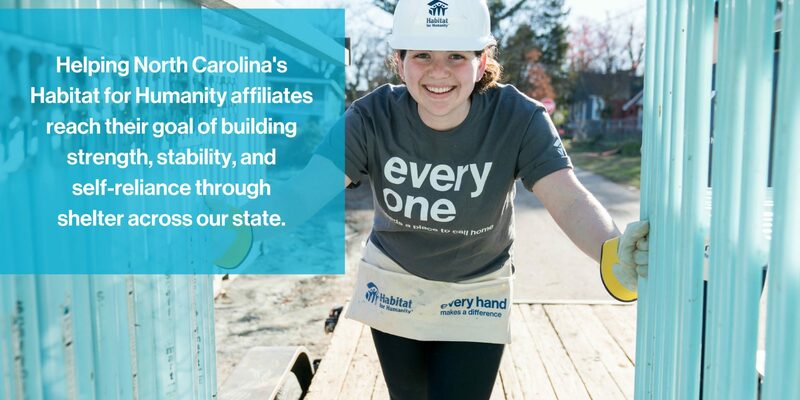 Founded in 2008, Habitat NC facilitates increased housing production and neighborhood revitalization efforts by coordinating advocacy activities, providing training and technical support opportunities, aiding in disaster recovery, and engaging in resource development that benefits our affiliates statewide. North Carolina’s Habitat for Humanity affiliates are not subordinate to the SSO, rather, we exist to serve them. Learn how to get involved with builds around the state, as well as how to become a Habitat homeowner. Find out about our work to advocate for affordable housing legislation and support, at both the state and federal levels. Your support is vital to the work that we do. Help us provide the best possible resources for North Carolina's Habitat affiliates. Before you go shopping for housewares and furniture anywhere else, be sure to check out your local Habitat ReStore.